8o per cent of CCG’s are failing to meet the NICE guidelines, which says that all eligible couples under the age of 39 should be offered 3 full cycles of IVF treatment. According to an audit released today by Fertility Fairness. The Audit of all the CCG’s found that 40 percent did not offer a full cycle of IVF and 3 per cent offered nothing at all – including Cambridge. In the last two years, 30 CCGs have reduced NHS fertility services, and one in ten CCGs is currently consulting on cutting or removing NHS fertility treatment. #Scream4IVF is a campaign led by Fertility Network UK to reform the current inequality of IVF treatment across the UK. Fertility Network says that in the UK, 3.5 million people – or 1 in 6 couples – are affected by the devastation and pain that fertility issues wreak. Yet most local health authorities unfairly deny couples the medically recommended fertility treatment. “Access to IVF has become a ‘postcode lottery’ and we want to ensure that the NHS and Clinical Commissioning Groups (CGGs) follow the recommended guidelines of three free cycles of IVFs. So, everybody, everywhere has access to treatment”. The National Institute for Health and Care Excellence (NICE) guidelines say that women under 40 should be offered three cycles of IVF on the NHS if they have not conceived after two years. But, in reality, access to free IVF treatment in England varies depending on where you live and the policy of your local CCG which funds the treatment. 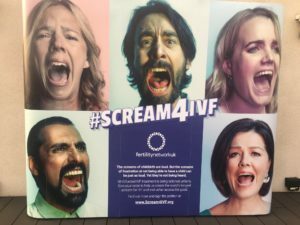 So, together with IVFbabble.com, the charity has launched a campaign #Scream4IVF, which aims to collect 100,000 signatures so that the issue of unfair IVF access can be debated in the Houses of Parliament. Fertility is not solely a female issue – men are half the fertility equation too – so it’s time to explode some male fertility myths. Did you know one of the most common reasons for a couple to try IVF is because of male factor problems? Share and tweet our top five male fertility facts. Do you know your employment rights during fertility treatment? FNUK highlight what people can and should expect from their employer when facing fertility issues and going through treatment. Share and tweet fertility at work facts. FNUK focus on fertility education. Do you know your fertility vital statistics? For women, they’re 28:35:42. 28: female fertility is already falling, 35: female fertility plummets, 42: your chance of becoming a biological mother is vanishingly small. Share and tweet our future fertility facts. World Fertility Day is about education, empowerment and understanding. IVFbabble.com founders, Tracey Bambrough and Sara Marshall-Page will host the central UK event at Little Italy, in Soho, London and have invited leading fertility experts in every field across the globe to join them to offer their knowledge. Louise Brown, the world’s first IVF baby, will also be supporting the event and answering calls. Be heard – If you feel strongly about funding then do ensure you take part in consultations – many CCG’s review their decisions at intervals. Get advice – If you are concerned about your fertility we are offering a free consultation with a fertility nurse specialist for a limited period – just phone 01954 717210 to book your appointment. Get tested – As funding for IVF is cut we also notice that less NHS testing is occurring – a fertility test for you and your partner will reveal if there are any underlying issues; if there are none, then lifestyle advice or a short course of medication to boost your egg production might be sufficient to improve your chances of conception. Fertility tests can be completed within one menstrual cycle and there is no waiting list. For a limited period our Fertility Health + Wellbeing checks are available at half price. Consider your options – IVF might seem an expensive treatment, but the cost can reduced with a multi-cycle package or money-back guarantee programme if you are unsuccessful (including unlimited IVF cycles over a two year period for a fixed fee). We have teamed up with Access Fertility to help make treatment more affordable. Talk to us – Only a few people struggling with infertility need IVF – there may be other options to try first, but the sooner you try the better. If you are concerned the key thing is to act now. Let’s talk.